All New Dimension Leader are made of a very fine Dyneema in Germany. Their knotless, conical taper gives perfect transmission of casting energy from line to tippet. They feature built-in loops at both ends. The bigger one loops onto the loop-on at the end of your flyline, then loop your tippet onto the smaller one. There are three different types of leaders for trout, and for steelhead and salmon fishing. Sinking leaders are for nymphing and wet fly fishing. They consist of three sections. The first one, next to the flyline, is without weight. In the midsection we add a bit of weight, and in the last section we add most of the weight. This way the weight works close to the fly and that´s what we want. These leaders have a full-lengt taper, too. Fast sinking leaders are for fishing fast water or deeper pools. These leaders consist of two sections. The first one is tapered but witout weight for easier casting, the second one is the section with the heavy weight to get your fly down. Very fine Dyneema leader, tapered, and knotless, with perfect transfer of casting power right to the tippet. This leader has no memory whatsoever, and other than monofilament leaders it has practically no stretch. 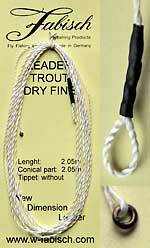 The length without tippet is 2.05m (82 inches). I suggest to use a tippet approximately 70 cm to 100 cm long (28 - 40 inches). A new feature in this leader is the small metal ring at the end. To assure absolutely uniform quality, I have decided to use the rings that Stroft manufactures. I use the smallest size which can hold 8 kg (over 17.5 pounds). Stroft has come up with a new improved version of its tippet material dispenser which gives the impression of a beautiful and functional tool. 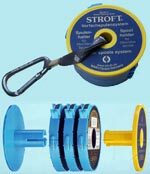 The Stroft Tippet Dispenser System consists of the spool holder, the short strap and three or five cutter rings. The spool holder holds three or five spools of tippet material (25 m or 50 m). Of course it is more economical to use 50-m-spools. The carabiner allows you to quickly attach the system to your fly vest, your waders or your rain jacket. You may also change quickly from vest to wader. Without the short strap, you may as well put it into your pant or vest pocket. serves to attach the Spool Holder to your vest, waders or what have you, provided it has an o-ring, eyelet or the like. Stroft GTM is my favorite leader material for dry flies and nymphing. It is available in spools of 25m, 50m and 100m. If you use the Stroft Tippet Spool System, the 50m spool is the first choice.